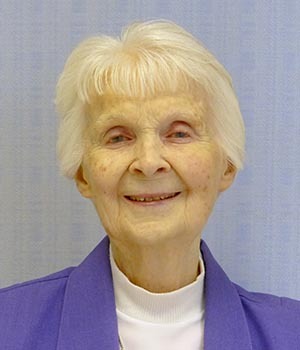 Teacher, administrator and coordinator of community outreach are all ways that Sister Nancy lived out her ministries. She was a community woman. Those that knew her described her as generous, joyful, solid and steady. She had the ability to live in the present and was accepting of situations, persons and her own reality. Sister Nancy was someone who enjoyed life and was fun to be with. 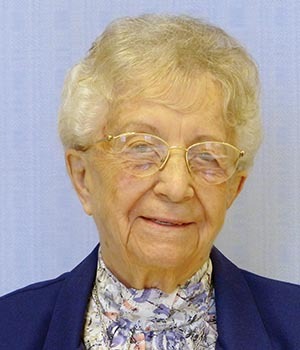 Sister Nancy was born in Lancaster, Pennsylvania on February 1, 1928, to George William and Helen (Gochenour) Ganse. Her mother was a homemaker and her father was an employee at the Hamilton Watch Factory. She has two brothers, Robert, who makes his home in Winchester, Virginia, and Daniel, who lives in Manheim, Pennsylvania. Nancy attended the Sacred Heart Parish School and was taught by the Sister of the Immaculate Heart of Mary. Lancaster Catholic, where she attended high school, was staffed by the Sisters of the Holy Cross as well as religious sisters from other communities. Nancy and her classmate, Sister M. Francine (Klein), both shared a love for football. Francine was a cheerleader and Nancy a drum majorette! Her athleticism continued through the years. When she retired to Saint Angela Hall she took advantage of the pool and swam every day. In 1945, Nancy received her high school diploma and soon found employment as a comptometer operator in the payroll department of the Armstrong Cork Company. At some point during her school years, she knew that she had a religious vocation. Her contacts with Holy Cross Sisters helped her realize God was calling her to join them. On her eighteenth birthday, February 1, 1946, Nancy entered the Sisters of the Holy Cross. 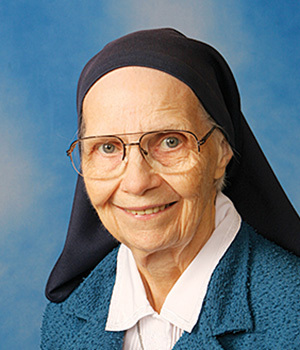 She received her religious name, Sister M. Georgellen at her reception on August 15, 1946. On August 15, 1948, Sister Nancy made her initial profession of vows. She was a member of the Congregation for 69 years. In the late 1960s, when it was permitted, she returned to the name her parents had chosen for her at her baptism, Nancy. 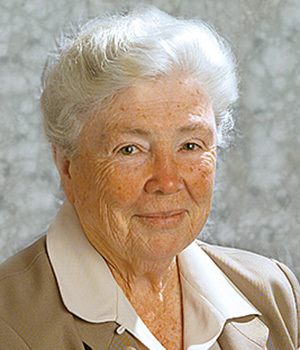 For seventeen years, Sister Nancy taught in Catholic elementary and high schools in Washington, D.C.; Norfolk, Virginia; Austin, Texas; and Kensington, Maryland. She was knowledgeable and very organized. 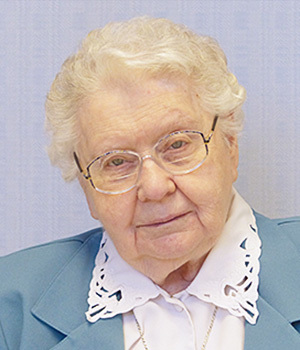 As a teacher, Sister Nancy was known to be “tough.” She held her students to high standards, which they did not often appreciate at the time, but were most grateful for in later life. 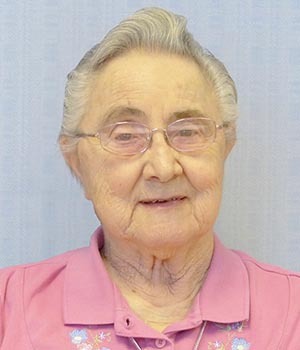 You often hear the question, “What would you like to do in your retirement years?” In her retirement, at the young age of 66, Sister Nancy and her good friend, Sister M. Charles Lucille (Woltering), headed south to Tompkinsville, Kentucky, to serve the rural poor of Appalachia. Tompkinsville was a town of about 4,000 with a 48-bed hospital, three stop lights and a mission church with Mass on Thursday and Sunday. The local newspaper was published twice a week and one needed a post office box to receive mail. Together Sisters Nancy and Lucille established a thrift store, food pantry and an emergency shelter for the needy in the area. Frequent trips were made back to Mount Carmel in Columbus, Ohio, to collect donated items gathered for the sisters’ new ministry. The women of Mount Carmel were truly partners in ministry with the sisters. In rural areas, available housing was non-existent. They lived about eight miles away in a town of 400 called Gamaliel. Their two-bedroom apartment was in the local funeral home, Strode’s Funeral Chapel, as it was required by statute that someone must be in the facility at night when they had a body. If the sisters needed to go away, the grave digger and his wife were called to stay overnight. These accommodations suited their needs. They were comfortable and the location was convenient. For eight years, Nancy and Lucille made this their home. Their presence and service in the local community were greatly appreciated. In 2002, when illness prevented them from continuing in Kentucky, Sister Nancy retired to Saint Angela Hall and Sister Charles Lucille to Saint Mary’s Convent. 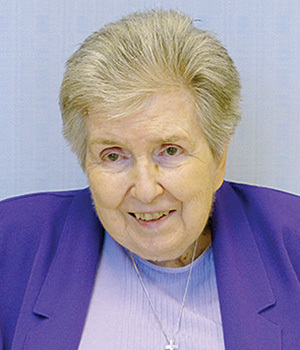 Upon her arrival at Saint Angela Hall, Sister Nancy made herself available to the other sisters. She generously served as a driver, taking them to appointments, to shop and to visit family and friends. She was a woman of many talents. She was an excellent seamstress and liked to knit and crochet. 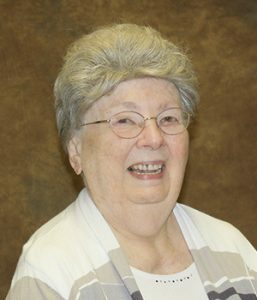 Sister Nancy also was an avid reader and well-known for her skill at Sudoku and crossword puzzles! Sister Nancy knew what she was about. 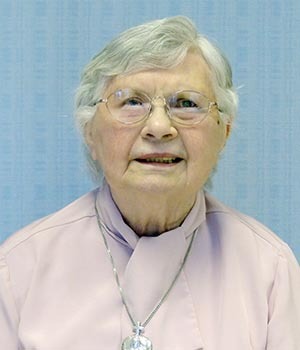 She once said about her ministry at Mount Carmel School of Nursing, “I feel like we have to bring Christ, not only to the students we teach, but the instructors with whom we work.” She was one of only two sisters there at the time. Her spirituality was deep and rock solid. She was engaged in the moment and tried to make the best of each day. A no-nonsense person, Nancy would say, “Get a grip, get over it!” She accepted the things that she could not change. She was practical, a community woman who sisters felt comfortable being around. She set them at ease. At Saint Mary’s Convent, sisters were impressed by her acceptance of the moment. It was said that, “one could sense that she lived in the presence of God.” She often shared that she was so grateful to the staff who provided for her care.